Royal Enfield, the Eicher Motors-owned cruiser and touring bike specialist, is cashing on its rich military heritage to strengthen its brand image and drive sales worldwide. The latest attempt is the launch of the new Classic Signals 350 motorcycle priced at Rs 1.62 lakh last week to boost sales in Asia’s third biggest economy. The new motorcycle pays homage to the Indian Air Force and Army and carries a premium of around Rs 15,000 over the standard rear-disc brake equipped non-ABS Classic 350 bike model. Sales at Royal Enfield jumped 23 per cent last fiscal at 8,20,121 units, up from 6,66,135 units it sold in the previous year. In April-July period, sales grew 19 per cent at 2,94,424 units, up from 2,48,457 units it sold in the same period last year. In July month alone sales increased by 7 per cent at 69,063 units, including 2,062 units in international markets, clocking 58 per cent growth in overseas. The new Classic Signals 350 motorcycle celebrates its 65-year association with the Indian Armed Forces, specifically the Indian Army Corps of Signals. Royal Enfield has tried to convey its story of its long legacy in India, having originally been a supplier to the army for service motorcycles. The Indian Army Corps of Signals is the division that overseas military communications for the armed forces. “We have been associated with Indian Armed Forces since in the early 1950’s and continue to be the largest supplier of motorcycles to the armed forces till date,” Rudratej (Rudy) Singh, president at Royal Enfield said. Available in Airborne Blue and Stormrider Sand colours, the two motorcycles represent the company’s pride of partnering with the men and women who guard Indian skies and land, he pointed out. The bike comes with the unique stencilled numbering on the fuel tank for each of the bikes produced and also gets the Corps emblem alongside. In May 2018, in collaboration with the British Ministry of Defence, the company launched the Royal Enfield Classic 500 Pegasus Edition motorcycle at the Imperial War Museum, Duxford. It was the brand’s homage to Flying Fleas, the Ro-yal Enfield’s legendary ligh-tweight motorcycle, used by the Parachute Regiment during World War II. Interestingly, the 1,000 limited edition commemor-ative motorcycles were bad-ged with the Airborne Regi-ment’s Pegasus insignia and a unique serial number stencilled on their tanks. Each machine was a piece of history, a tribute to the resilience of the company, a salute to its long-standing partnership with the armed forces, and a motorcycle that any Royal Enfield enthusiast would be proud to ride. No wonder Royal Enfield Limited Edition Classic 500 Pegasus motorcycles were sold out in 178 seconds. 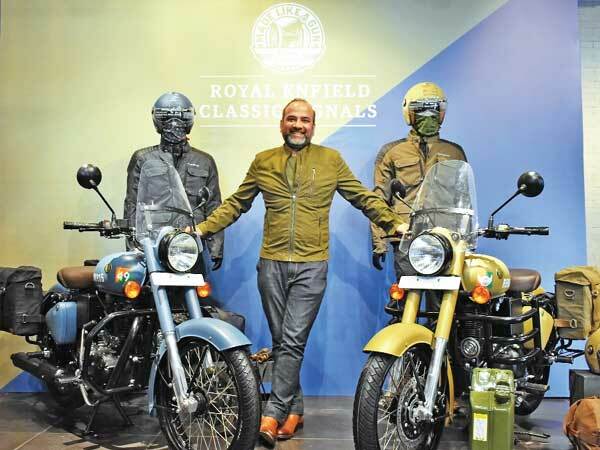 “In India too Royal Enfield, which had allocated only 250 units out of the 1,000 units of the limited edition of the Classic 500 Pegasus motorcycle, sold them all on its website under three minutes,” Singh said. They all have become truly collector’s item, he pointed out. Royal Enfield Classic 500 Pegasus Edition bikes were priced at Rs 2,49,217. Each of the 250 limited commemorative models were sold along with a set of bespoke military-style canvas panniers bearing the Pegasus logo, one helmet and a T-shirt from the Pegasus collection. The limited-production apparels and accessories of this collection are also adorned by the official military insignia and the Pegasus emblem. Each motorcycle has authentic markings of military motorcycles, including brown handlebar grips, a leather strap with brass buckles across the air filter, blacked out silencers, rims, kickstart, pedals and headlight bezel to complete the period look. In addition, co-nsumers can also buy a ran-ge of genuine motorcycle accessories that are compatible with the motorcycle. The ‘Pegasus’ is inspired by the legendary RE/WD 125 Flying Flea motorcycle that was manufactured at Royal Enfield’s facility in UK during the World War II. Simple, tough and resilient, the Flying Flea (or WD/RE to use its official title) was deployed extensively during World War II as a front line combat machine. An invaluable asset to the elite soldiers of the newly-formed Parachute Regiment, it was dropped from aircraft in a protective steel cradle or carried in assault gliders towed by aeroplanes. On the ground, it was used for reconnaissance, communications and transporting soldiers into battle. “The association with the Pegasus Parachute Regiment is another reminder of how Royal Enfield history is deeply steeped in motorcycling pedigree. The Classic Pegasus edition, like many of our other armed forces inspired variants, has become a collectors’ piece. We have been making army tough and versatile machines – ‘Made Like a Gun’ – since 1901, and we will continue to share some of these ‘hidden gems’ and stories through our motorcycles,” Singh said. “These new Classic 500 Pegasus motorcycles encapsulate a lot of the history and legacy of Royal Enfield. This is something only Royal Enfield could have done. Many brands have military motorcycles in their past but only Royal Enfield has the Flying Flea,” Mark Wells, Royal Enfield’s head of Global Product Strategy and Industrial Design, pointed out.